The Freemasons have placed full-page advertisements in several national newspapers calling for an end to the "discrimination" against their members. The United Grand Lodge of England (UGLE) said it welcomes individuals from all walks of life but that members are "undeservedly stigmatised". It said it had written to the Equality and Human Rights Commission. Recent news stories questioned the influence of Freemasons in policing and in parliament. In an advert in the Times, the Daily Telegraph and the Guardian, the governing body of Freemasonry complains of the "gross misrepresentation" of its members. Under the headline "Enough is enough", chief executive Dr David Staples said the organisation raised more than £33m for good causes last year. He said people of any race, faith, age, class or political persuasion were welcome in the 300-year-old organisation. The United Grand Lodge of England is restricted to men, although separate women-only lodges also exist. 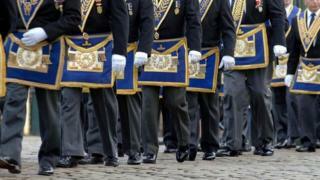 There are about 200,000 Freemasons in England and Wales, who meet in more than 7,000 lodges. In the last week, the Guardian reported that two Freemasons' lodges are operating at Westminster - which it said were for MPs and political journalists. But Dr Staples said that, although the lodges existed, none of their members were MPs or political journalists. The revelation followed claims that members of the Freemasons were blocking reform in policing. The outgoing chairman of the Police Federation, Steve White, told the Guardian the society was thwarting progress of women and those from black and ethnic backgrounds. Dr Staples rejected those claims as "laughable". He told BBC Breakfast: "We're not a secretive society. Nepotism (and) corruption is not tolerated." He added that the handshake used by members during ceremonies is "not secret" but, when he was asked to demonstrate it to viewers of BBC Breakfast, he declined, saying he had "promised" not to. The advert adds that the organisation will be running a series of events this year designed to answer questions people may have about the organisation, whose activities are not widely known. Dr Staples also invites direct queries to be sent to the Freemasons' London headquarters, Freemasons' Hall. But some have responded to the adverts with scepticism. How can members be discriminated against if "we don't know who they are", asks Labour MP Melanie Onn.